"Anderton's Desire" is the name that has been attached to a story-and-a-half frame house that stands on the south side of School Street (MD Route 14) on the western side of East New Market, Dorchester County, Maryland. The two-room plan frame house faces north with the principal gable oriented on an east/west axis. Attached to the back of the main block is a single-story colonnade that joins the one-room kitchen. A dovetailed log smoke house stands behind the kitchen. Built around 1800, the story-and-a-half frame house is supported by a continuous common bond brick foundation, and it is sheathed with a combination of wide beaded weatherboard and plain weatherboard siding. The steeply pitched roof is covered with a layer of seamed tin. The north (front) elevation is a two-bay facade with the entrance located in the eastern bay. A hip roof porch supported by square posts shelters the front door. An ovolo molded backband surround frames a Greek Revival two-panel door. The adjacent western bay is filled with a nine-over-six sash window that is also framed by an ovolo molded surround. The boxed cornice that defines the base of the roof is trimmed with an early nineteenth-century bed and crown molding. The east elevation is a three-bay facade uniformly covered with wide beaded weatherboards. Three nine-over-six sash windows framed by ovolo surrounds light the first floor, while a pair of six-over-six sash windows light the second floor. The gable end is finished with a beaded edge bargeboard. The west elevation, on the other hand, has only one nine-over-six first floor window, and a pair of four-over-four sash windows light the second floor. The second floor sash flank the interior end brick chimney that protrudes through the roof. The gable end is finished with the same beaded bargeboard. The south end of the main block is largely covered by a single-story one bay hyphen or colonnade. The east side of the hyphen is pierced by a center entrance that is flanked by three-light sidelights. A short section of the south wall of the main block that is not covered by the hyphen is filled by a two-panel Greek Revival door. The single-story kitchen extends farther south and is partially covered on the east side by a partially enclosed shed roof addition. The enclosed section of the shed consists of a vertical beaded board wall that probably dates to the turn of the twentieth century. Like the house the kitchen is covered by a steeply pitched metal roof and sheathed with wide beaded weatherboards. The kitchen door is located on the east side under the partially enclosed shed roof porch. While the door is no longer in place, an adjacent six-pane window lights the one-room kitchen. The south wall of the kitchen is dominated by an exterior single-shouldered, five-course common bond brick chimney. The wall to each side of the chimney is covered by beaded weatherboards, and a small unglazed window lights the kitchen loft east of the chimney stack. The west wall of the kitchen is marked by a single six-over-six sash window that is framed by a cyma curve surround. The cornice is boxed. The adjacent hyphen wall has been reworked with modern materials. The two-room interior of "Anderton's Desire" has not been altered significantly since the early nineteenth century. The room-behind-room plan is heated by corner hearths, and the stair rises in the northwest corner of the front room. A slender turned newel post supports a molded handrail. A flat-panel closet door opens into the space beneath the stair, and the stair soffit is fitted with flat panels as well. Fixed in each corner of the front and back room are exposed corner posts that have a beaded edge board sheathing. Featured on the corner hearth wall is a large Federal style mantel with an ovolo molded surround and a heavily molded shelf. The dentiled bed molding repeats the same design as that found on the House of the Hinges, the Edmondson House, and the Henry Haskins house. The back room is fitted with horizontal board wainscoting, and a Federal style mantel distinguishes the corner hearth. The overmantel in the back room is covered with large pine boards. The second floor is divided into an upstairs hall and two bedrooms. At the head of the stair an unusual board partition is combined with a series of square balusters that form the stair partition. Vertical beaded board partitions divide the three-room second floor, and board-and-batten doors framed by molded surrounds provide access to each room. The bedroom and hall knee walls are covered with horizontal board wainscoting, and small knee wall doors with HL hinges open into the storage space within the eaves. The hyphen and kitchen interiors have been largely gutted. Exposed within the hyphen is the rear wall of the main block which is still sheathed with wide beaded weatherboards. Significance - "Anderton's Desire" is one of the most significant small houses still standing in East New Market. Built during the years surrounding the turn of the nineteenth century, the story-and-a-half frame house retains a beaded weatherboard exterior and its hyphenated service wing. The two-room plan main block remains well preserved inside with a large percentage of its original Federal style woodwork. Federal mantels are detailed with identical moldings that are found in several other East New Market dwellings, and point to a contemporary date and perhaps the same master carpenter. The finishes of the first and second floor rooms' were executed on a superior level of craftsmanship that is not matched in any other small house from the same period. The hyphenated service wing is also noteworthy as the regional method by which kitchens were joined to the main block. 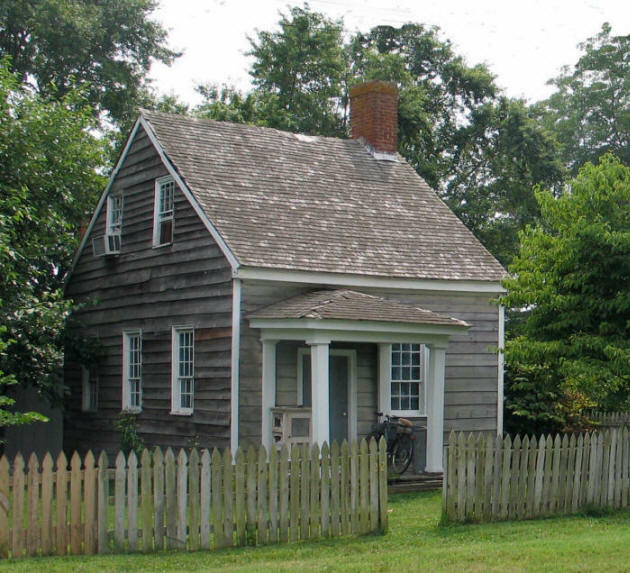 Built around 1800, the Little Manning House in 1852 passed by will from Major Anthony Manning to his son, Dr. Anthony L. Manning. Six years later, the house passed by will from Dr. Manning to his sister Mrs. Eugenia S. Thomas, better known as "Aunt Jennie" Thomas. In 1916, in Chancery Court, the property was divided. The dwelling and land as now owned were sold to Emma E. Stapleforte. The following year, the house was sold to Harry E. Parker who retained it for 26 years, selling it in 1943 to Edward Messick. It became the property of the East New Market Baptist Church by purchase in 1965. Little Manning House consists of six rooms and three porches. There are three large downstairs fireplaces. A kitchen fireplace is closed, but the large outside chimney is used. The largest upstairs bedroom has one fireplace. On the northwest side of the house is a quaint stairway. Wide paneling may be found in some parts of both floors. Most unusual is the weatherboard showing in the dining room and south end of the kitchen. It is of remarkable width and thickness. At the rear of the house, which is pegged , stands a log room whose date of construction is not known. A pegged barn of heavy hewn timbers and early architectural lines was torn down some years ago. The house known as "The Little Manning House" is next door to the east of the Wheatley house and is the E.S. Thomas House now owned by Oliver Hurt from SC. This house has been owned since the 1900s by a number of families. One was Harry Parker, Sr. who had sons, Brooks, Harry Jr., and Arthur, from whom I have obtained much of my information. The Parkers had a small farm with outbuildings like many other inhabitants of E.N.M. The Parker's converted the "Little Manning House" from outbuilding back to a residential structure. Later the house was used as the Baptist parsonage. In 1943, Mr. Parker sold the house to Mr. and Mrs. Walter Merrick and they used it as a residence. 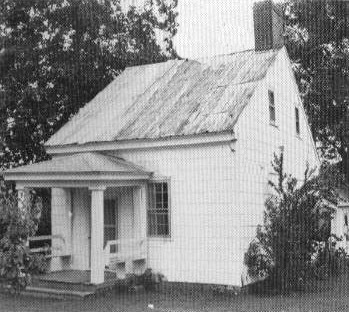 Mrs. Merrick left it to the Baptist Church in her Will, and it was used as a Baptist parsonage. From "Between The Nanticoke and the Choptank, An Architectural History of Dorchester County, Maryland" Edited by Christopher Weeks, with contributions by Michael O. Bourne, Geoffrey Henry, Catherine Moore, Calvin Mowbray, M. Fred Tidwell. Several of us, working independently, came to the conclusion that this was the Anderton farmhouse. On November 8, 1704 (6 Old 121) Francis Anderton purchased from Phillip Taylor "Westward" 100 acres and part of "Bath" 299 acres. Francis Anderton's will was probated March 10, 1714 (Md. Calendar of Wills). In it he leaves to eldest son John his part of "Bath" and 50 acres of "Westward" including dwelling plantation at decease of wife. As I think I have it documented somewhere that Phillip Taylor lived elsewhere, it seems sensible to assume that Francis Anderton built this house between 1704 and 1713, probably closer to the earlier date. But, I have no explicit documentation for this. Further research could possibly disclose that the kitchen wing of the Brick Hotel was the Anderton house, but until we have more facts and documentation we will have to "stay where we are". There seems to be some evidence that this was built before 1700, which was pre-Anderton. Very intriguing. It's this sort of thing that keep us at it and is very frustrating when we can't get to it. When comparing the 1877 and the 1922 maps, the fifth structure from the left on the 1922 map is the correct shape and is in the correct position to be the E.S. Thomas House. The mapmaker in 1877 primarily depicted residential and commercial structures. A possible conclusion is that in 1877, "Anderton's Desire" was likely used as an small outbuilding. Therefore it would not have been pictured. Other possibilities are that the larger E.S. Thomas footprint is actually the smaller "Anderton's Desire" structure depicted in 1922. Maybe the mapmaker drew the footprint too large in 1877. Another less likely possibility is that this very old structure was moved from elsewhere in or near town. A TRIBUTE - In the passing away of Mrs. Eugenia S. Thomas, at her home in East New Market, on March 13, 1916, Dorchester County lost one of her oldest and most representative citizens. Mrs. Thomas belonged to the old school of gentlewomen, (that school that we all love so well) noted for its strong uprightness of spirit, its genial hospitality, its tender sympathy, and its loving kindliness. Her gentle life of good deeds untold is an everlasting memory in the heats of all who knew her. Mrs. Thomas was the oldest living communicant of St. Stephen's Protestant Episcopal Church, and in her younger days was one of its most active members. Mrs. Thomas was a daughter of the late Maj. Anthony Manning, of the War of 1812. She was twice married, her first husband being the late Dr. William Vans Murray Edmondson, and her second husband the late Dr. James Henry Thomas, both of Dorchester County. She is survived by many nieces and nephews of the families of Manning and Vincent. She also leaves four step-grandchildren, the children of her stepdaughter, the late Mrs. Emma V. Edmondson Jacobs, and one great-grandson. DEATHS - Mrs. Eugenia S. Thomas - Entered into this life eternal on March 13th, 1916, Mrs. Eugenia S. Thomas. Mrs. Thomas was the daughter of Major Anthony Manning. She was twice married. Her first husband being the late Dr. Wm. V. M. Edmondson, and her second, was Dr. James H. Thomas. For many years she was a member of the Episcopal Church, and while devoted to her communion and fellowship, was hindered from active participation by bodily infirmities. One of her friends, who often visited her home in East New Market, to take sweet counsel with her. Thus her gentle existence passed in quietness and assurance 'till the evening came and she fell asleep. Loving hands, tenderly laid her mortal remains to rest in the East New Market Cemetery, among her friends and loved ones.